Can you tell I’m in the holiday spirit? I am a huge fan of Christmas cards. My family has taken a Christmas card since I can remember, and it is always fun looking back at us through the years. Plus, who doesn’t like getting a nice letter in the mail instead of everyday bills and junk mail? 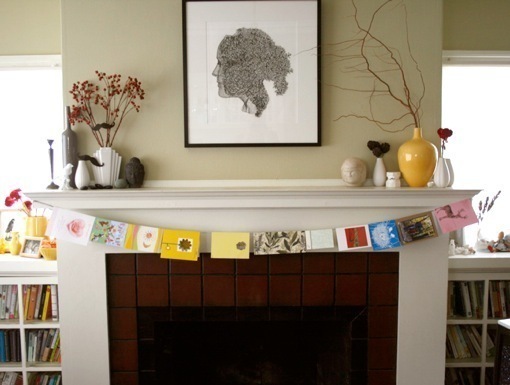 This is a simple way to showcase the cards you receive (yes, the more you receive, the more friends you have….kinda like Facebook friends) and a cheap decorating technique. If you don’t have the cards that can just hang on twine, use small clothes pins or paperclips. Love this – now I only need to receive some Christmas cards…. ← Wen – Where have you been?